Anthony Kotoun didn’t spend much time in the lead of the 11th Hour Cup’s racing fleet on Sunday, though you wouldn’t know it from the scores: the Virgin Islands native and longtime Newport resident scored another four first place finishes from five races, identical to his scoreline from Saturday. Second-place Matt Knowles was the worst effected by Kotoun’s penchant for being in the right place at the right time. He led the way around the course for most of three races, only to get pipped at the pin by Kotoun in two of them. Sunday featured the biggest spectator crowds yet at the tip of Sail Newport’s historic and picturesque Fort Adams home, with hundreds of locals and visitors enjoying the action from the Moth fleet and the ocean racers of the Atlantic Cup, sharing a starting line barely 200 meters from the crowd’s picnic blankets and folding chairs. 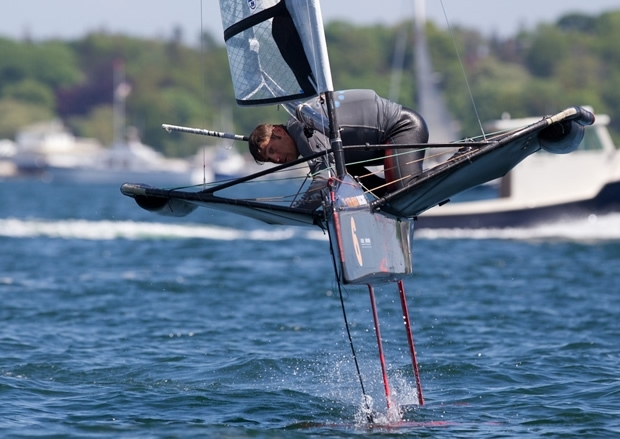 They weren’t the only ones enjoying the scenery on Narragansett Bay, though; 11th Hour Cup leader and reigning Moth US National Champ Kotoun says he’ll never get bored racing in Newport. “I can’t think of any other place where you have all this going on at one time, and even in the middle of a race, you can’t help but love it,” said Kotoun, referring to the hundreds of sailing vessels on the water for the unofficial opening of summer. “You’ve got 12 meters in tacking duels, Class 40s from all over racing around the cans, beautiful historic schooners, Open 60s, Maxis, and cruisers and racers of every size and shape. How can you beat that?” he added. Just one more day of racing remains for the inaugural 11th Hour Cup, with Newport’s sea breeze finally scheduled to kick in with gusto, giving Tommy Loughborough and first-time Moth racer Brooks Reed some power to play with as they fight for the final podium position. Loughborough and Reed are tied on 28 points, and the fleet expects 15-20 knots of breeze for today’s final five races. The action begins at 11 AM on Monday.